Looking your best on one of the biggest days of your life starts with hiring Makeup by Marie-Lynn to keep your face looking fresh and beautiful. 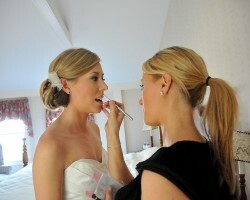 This artist does wedding hair and makeup that will match your personal style as well as the style of the occasion. The best part is that the look will last through the Texas heat and through dancing all night long. You will not only look your best but you will love the entire experience too. At Lucie Marie, the best Austin makeup artists, they only use the highest quality, top-of-the-line makeup products and provide their clients with personalized one-on-one services. This team knows that a wedding can be stressful for everyone involved but especially for the bride. If you are concerned with the way you will look on your big day and would like to have that stress taken away then you need to hire the professional team at this company to do your makeup and the makeup of your bridal party. Adrienne, the owner and operator of Makeup by Adrienne, has been creating flawless looks for brides and various other clients for over 12 years. In that time, Adrienne has experimented with different skin routines, makeup products and techniques to land on the trusted system that she uses with each of her clients today. She is becoming famous as a makeup artist in Austin, TX but is also known throughout the country for her work. When you work with this artist, you are guaranteed to feel like a celebrity. If the reviews of Makeup By Sommer are any indication of the talent of the makeup artist then brides can count on this company to offer the best makeup artistry and looks in the business. You can customize your look to include a dark lip, or something more natural, strong lashes or just a light lining. The best part is that the services of this company come at affordable prices too even when you would like to hire this company to complete looks for the entire bridal party. Christie Griffin grew up with a love of being creative. This passion flourished and became a permanent makeup obsession. She went to school to become a qualified makeup artist and now offers some of the most beautiful bridal makeup in the industry. Every client that works with Christie for any occasion is treated like royalty. You will feel an instant connection as she brings your dream look to life. You can rest assured that you are always in good hands with this artist.